click on sound file below to hear Rockin' Chair Hard Maple on my Kalamazoo tenor conversion. This hard maple came from a disassembled rockin' chair that was given to my wife by a co-worker. Not sure of the age exactly but it's at least 35 years old. This wood has nice volume, clarity and sustain. Reminds me of the Wurlitzer Organ wood I use to have. Looks and sounds very much like the Organ wood that Y.Z. Newberry sent me years back. Very " bell like " tone. Price: $22.00 + $4.00 shipping in lower 48 .....$12.00 shipping to Canada.. shipping to all other countries @ $16.00. Click on sound files below to hear the 1941 Gym Floor Hard Maple on my RB-00 Kalamazoo/Sullivan conversion mahogany banjo. Thanks to Steve Shepherd for sending me this old gym floor wood that came from a middle school gym floor in New London, NH. The school was built in 1941. This wood is much like the Drop Forge maple except it has a brighter top end with a nice mid range. 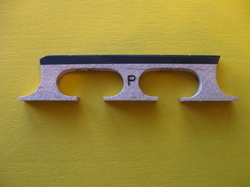 It has a nice "pop" coming off the strings and is very responsive. Great volume and power! Your choice of spacing: Standard,Crowe, or a spacing of your specifications. I offer radius tops as well. Click on sound files below to hear Doug Knecht play the Drop Forge Hard Maple bridge on his Yates V33 ring/rim & Davis mahogany neck . I was very fortunate to have Parker Buckley, a customer, send me some old hard maple that was used to hold the weights on a drop forge hammer at the Irwin Auger Bit Company. He had been holding onto this wood for the past 30 years. This maple has really nice mid range as well as a great 4th string. Very powerful tone with plenty of volume. It sounds great on both my curly maple banjo as well as my mahogany. ​​Price: $22.00 + $4.00 shipping in lower 48 .....$12.00 shipping to Canada.. shipping to all other countries @ $16.00. 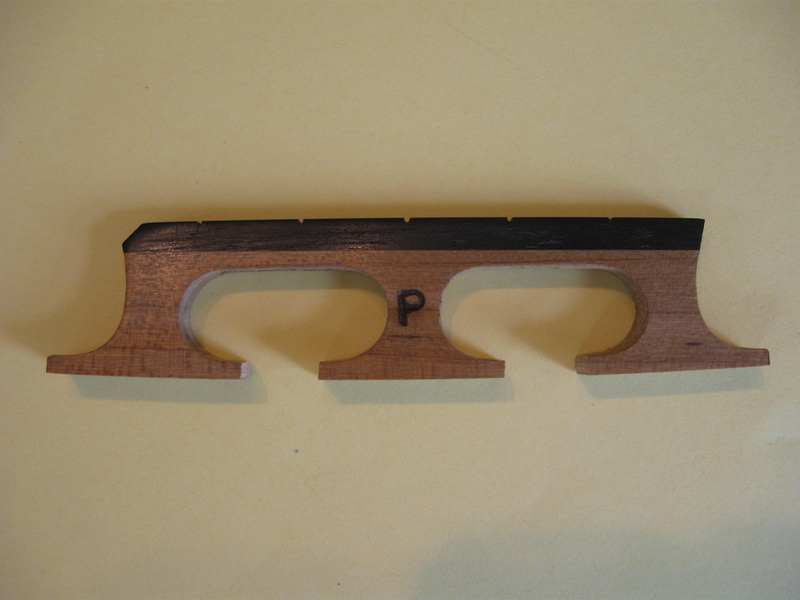 Click on sound files below to hear the Table Leg Hard Maple bridge on my RB-OO Kalamazoo/Sullivan conversion. I got two large hard maple tables from a local Dillard's clearance store at the Asheville Outlet Mall. My wife works there and the manager was going to throw them in the dumpster. I was able to salvage them and boy! I'm glad I did! This is excellent sounding hard maple. It is nice and bright with just the right sustain. Very responsive and volume to spare. The tables are around 25 to 30 years old. Sound files coming soon. ​ I got two large hard maple tables from a local Dillard's clearance store at the Asheville Outlet Mall. My wife works there and the manager was going to throw them in the dumpster. I was able to salvage them and boy! I'm glad I did! This is excellent sounding hard maple. It is nice and bright with just the right sustain. Very responsive and volume to spare. The tables are around 25 to 30 years old. Sound files coming soon. ​​​Price: $22.00 + $4.00 shipping in lower 48 .....$12.00 shipping to Canada.. shipping to all other countries @ $16.00. Click on sound file below to hear the Old Gym Floor Hard Maple on my mahogany banjo with Memphis Belle no hole ring. my good friend Kirk Barker from Suches, GA.. Kirk and Barry Abernathy drove up one day and brought me some of this maple flooring that came out of a school gym around the area he lives. It is some great sounding bridge wood. Very much like the Select Maple but a little more volume. This wood is around 60 to 70 years old. Click on sound files below to hear the Birdseye Hard Maple, with African Blackwood top, on my mahogany banjo with Memphis Belle no hole ring. here in Western North Carolina. You will find some birdseye markings in the grain of these bridges. I hand pick close grain 2" x 2" x 18" blocks. I've tried African Blackwood as well as Gabon Ebony for top wood and both sound great on this wood. This is one of the closest in tone to the old flooring wood that I've come across. The "Hide Head Blues" sound file is Roasted Red Maple with Ebony top. This *New* second batch of Roasted Red Maple has some beautiful markings on the quarter sawn back side. The grain lines are nice and straight and are closer than my last batch. This wood is a little darker. Just like the last batch, this wood has excellent tone like most Red Maple. Nice sustain with a richness to the notes. Excellent 4th string as well. 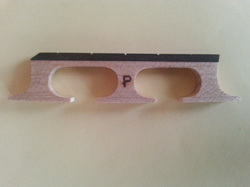 Red Maple Bridges are made from the finest red maple selections. The tone is very clear, open, with good volume and sustain. A great choice for melodic style players as well as Bluegrass Scruggs style players. Ambrosia Maple is simply Maple wood that was infested with the Ambrosia beetle. Don't let that turn you away!! It has turned out to be some of the best bridge wood I've come across. It is very much like the regular Red Maple I have except for the color variations from the beetle infestation. This new Ambrosia Maple has quite a bit of dis-coloration through out the wood. I stay away from the beetle bore holes but you may see some coloration in some places on these bridges. 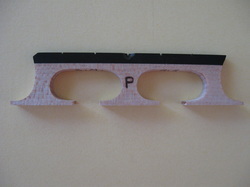 It has volume to spare and very balanced all over the fingerboard. It produces a nice 4th string bass tone too. **Just in** New Select Hard Maple! This new select hard maple is the best new hard maple I've come across to date. This maple comes from a local exotic wood supply house. It has great note separation and with just the right balance of sustain. I have two varieties of Select Hard Maple. One comes from outside North Carolina and the other comes from within a 30 mile radius of Asheville, North Carolina. Both are very similar in tone. This *New* Black Locust comes from a local hardwood lumber yard. The wood originated from southern Virginia. 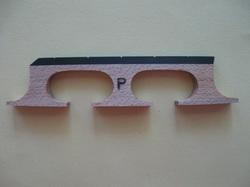 Locust has been a favorite bridge wood to many open back clawhammer players. The hard dense wood tends to give a nice quick decay with great volume and note separation. 4 string tenor regular style. Works with Mike's Tenor Mute. Your choice of spacing of your specifications. I offer radius tops as well.